Note my third dog, Ollie, taking care of Barney's oral hygiene (drooling). "The 3 Amigos" made such a good impression that one friend said she was going to talk to her husband about adopting a second shelter dog. 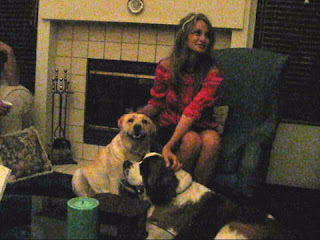 The lady petting the pups is friend Kathy Herington, formerly with The Mar-Dels. The background singer is friend, Laurie Lehman, a former blues singer turned social worker. The cockatoo is Lucy, Joey's new booking agent. Wow, what a great video. I felt like I was there. I'm so glad you posted this. Lara looks so happy...she is on top of the world. What a bundle of happiness in that room. I so wish I could have been there.